Joshua Budich continues his awesome series of The Muppets screen prints with “Performing Feats of Lunatic Daring” featuring Gonzo the Great! 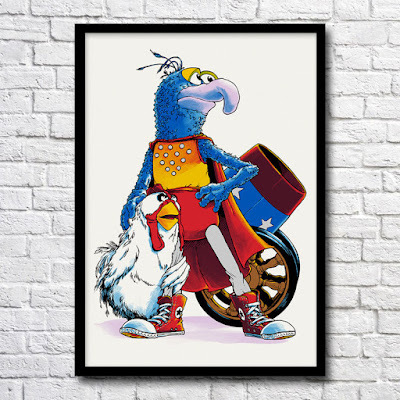 It’s a loving tribute to one of Budich’s all-time favorite characters, the Prince of Plumbers himself, The Great Gonzo, and his love, Camilla the Chicken. “Performing Feats of Lunatic Daring” by Joshua Budich is a 12”x18” signed and numbered 7 color screen print. Limited to just 100 pieces, this The Muppets Gonzo print is currently available at Budich’s online store for just $35. A few lucky collectors will even receive an Artist Proof copy of this Muppets poster!